At 15 years old, Kelvin Doe has done something people usually work years trying to do. He caught the attention of MIT, by teaching himself how to reverse engineer things — so he can build whatever he needs in his impoverished country. 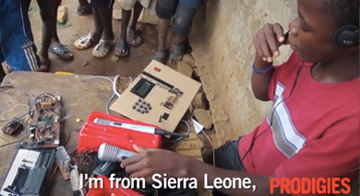 He has built musical instruments, a generator, and even an FM radio station for his local community. His radio show became popular in the area, with listeners even texting messages to Kelvin while he was on the air. Kelvin made the trip from Sierra Leone to the United States and became the youngest person to be invited to MIT's "Visiting Practitioner Program". While in the U.S., Kelvin continued to broadcast his radio show. It seems like this brilliant, caring young man has a bright future ahead of him. See for yourself in the video below, which we found on THINKR. And let us know your thoughts in the comments section below. Is Kelvin a remarkable kid?